Dr. Anjali knew she wanted to be involved in the healthcare field from the moment she began working at her mother’s medical office as a teen. It wasn’t until she learned that she could combine her love of art and patient care into one career that she decided to pursue dentistry. 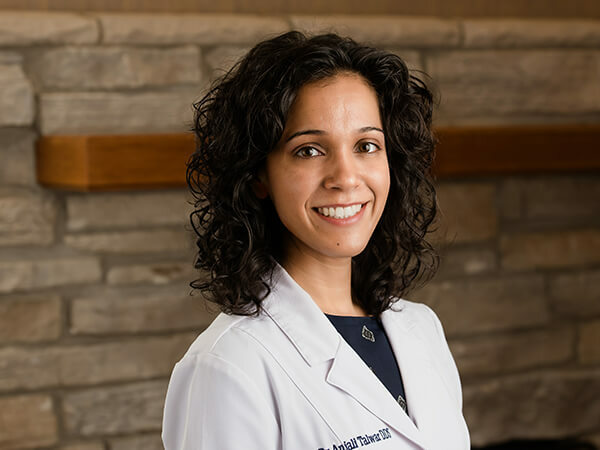 Dr. Anjali truly believes there is no better feeling than the relationships built with patients. She ensures that she provides the best care to her patients by pursuing hours of continuing education each year, and she is grateful to be able to learn from her colleagues as well as experts in the field. She is an active scholar of the Spear Center for Dental Excellence, like Drs. Mike and Kevin. Her training thus far has been in a variety of procedures that include advanced dental aesthetics and oral surgery procedures, such as implant placement and restorations, as well as the management of dental emergencies and medically compromised patients. She is also well-versed in treating patients of all ages, including pediatric patients. Dr. Anjali met Dr. Mike in dental school and have been together ever since. They have been happily married since June 2015. In her spare time, Dr. Anjali enjoys yoga and is an avid runner. She has competed in multiple half marathons as well as a full marathon and hopes to compete in another marathon in 2019. She also is an aspiring cook and one day hopes to be as good of a cook as her mother.